Our 2 bedroom top floor air conditioned apartment (70 m²) with south facing private balcony and exclusive roof sun terrace (70 m²) both with sea views is located on the attractive complex of La Mirada. It is ideally situated in the popular area of Playa Flamenca.The sandy beaches of Playa Flamenca and La Zenia are a ten minute walk away as are numerous shops, bars and restaurants. Tastefully furnished to the highest standard and is a home from home with all your home comforts, including Satellite TV (SKY sports/movies), air-conditioning (heating for winter), washing machine, microwave, DVD, iron/board, our apartment is the ideal home in the sun, and for those winter holidays, our large terrace is great for eating al fresco, with sun loungers, patio furniture. The lounge leads onto the balcony with sea views. It is an ideal location for a family holiday. There is a table and chairs on the balcony for outdoor eating and sunbeds on the roof terrace to relax in. Local golfing and beaches: Playa Flamenca is just a five minute drive to Villamartin -Championship golf course and ten minutes to Las Ramblas or Campoamor. The new courses at Algorfa (La Finca) or La Marquesa at Quesada are also easily accessible. A great variety of golf to really challenge your skills. Sandy beaches - regularly awarded 'Blue Flag' for Water quality and facilities - are less than 10 minutes away. Playa Flamenca Beach is walking distance (500 m) if you wish. The Blue Flag is an indication of Water and Beach Quality plus the standard of facilities on the beach including food & drink, children’s play areas, shower & toilet facilities. Shopping and markets: Playa Flamenca has two commercial centres Via Park I&II and Flamenca Beach Complex offering a wide range of restaurants with informal Tapas, Irish-Italian, Italian, Tex-Mex, Chinese, Indian, French styles and many more. The nearest supermarket is five minutes on foot ('Super Cor'), and plenty of choice within a short distance. A Spanish market is now held each Saturday on Playa Flamenca offering many bargains. There are also large markets held in Torrevieja on Friday, Guardamar on Wednesday and even a 'Boot Fair' on Sundays at Guardamar where you can pick up authentic Spanish household items. Torrevieja and around: This popular area is close to the town of Torrevieja and here you can find an evening 'Craft market' on the sea front as well as many restaurants and bars. You can walk the promenade 'Spanish Style' and stop off to enjoy a drink or meal at one of the many on offer. If you don't want to venture into town, Flamenca Beach Complex - 5 min away - is full of character and has a wide range of International Cuisine to choose from. Even closer are the two modern centres, Via Park I and Via Park II with the famous Abbey Tavern. Already there is a wide range of restaurants and bars available to enjoy. Only for apartment use. Please bring beach towels for beach & pool use. Lounge with 2 two setter sofas, latest SKY Digital TV and 14 UK radio stations. Air-conditioning is a must with temperatures as high as 40°C in the summer months. 4 dining room seats. Kitchen with fridge, hob, oven, microwave, toaster and iron & board. Main bedroom with 2 single beds fitted wardrobes, bedside cabinets and lamps. Second bedroom with 2 single beds fitted wardrobes and bedside cabinet and lamp. Bathroom with bath, shower, WC and basin. Utility room with washing machine. Balcony, table and chairs. Communal pool. Roof terrace (70m²) with BBQ, table, chairs & sun loungers. Thank you for your review. We will take up your issues with the dust with our management team in Playa Flamenca. With respect to the sheets, we will discuss with our management company on how we can rectify this issue. This is the first time this issue has been brought up over the last 14 years, but we will act on this issue. Initially, we offered a mid break bed change for our guests with holidays of 2 weeks or longer, this was never taken up by any of our guests. We are really glad you had a nice time and look forward to you booking with us in the future. We arrived with the taxi company who I would highly recommend. We got to the apartment and then left our stuff and headed out. We found some lovely bars just down the road from us. Lovely and friendly people in them. The tv didn't work the whole time we were there but we didn't mind as we went for walks at night. The other great thing was that chairs were provided to either take to the beach or the pool. The go karting was almost next to us and it didn't bother us the noise of them. We watched Netflix at the late evening which was built into the tv and that was another great thing to have. If we were going the next time I would probably hire a car or maybe even bikes as it's quite a walk to the big shopping mall and beach in the day time. I would also get one if we came back to go to the water park again. Bert and Ronda were great hosts would highly recommend them to rent from and it were very accommodating and responded as quick as they could to your emails. So thank you for having us and we hope to be back in the near future. Thank you very much for your kind review. We will pass on your recommendation to Alan and his team, our fully insured taxi company in Playa Flamenca. One of the reasons we bought the apartment in this location in Playa Flamenca was the restaurants and bars close by, as well as, the friendly people. We are sorry to hear that the TV signal was not working, I will contact our management team and get this rectified as soon as possible. We try our very best to ensure that you have as relaxing and a nice time on your holiday, we hope that we have everything in the apartment that you need. Although the beach is a 15-minute walk we find it quite pleasant, there should be a trolley in the utility room to carry the cool box and beach chairs, we also use the trolley to go to the closest supermarket Carrefour, which is only an easy 10-minute walk. La Zenia Boulevard which is a fantastic selection of shops is a good 20-minute walk if do not deviate to a watering hole both ways, which there are a few in both directions. Once again thank you for your booking and hopefully we can be of assistance with future holiday plans. We dealt with Bert the owner of the property who was a complete delight to correspond with, he made a recommendation for our transfers from Alicante airport to the apartment the transfer company were also great to deal with, the apartment it's self was very clean and completely functional with all modern cons and the wi fi was super fast, we also enjoyed the quiet and privacy of the location.. Thank you very much for your kind review. We try very hard with our team in Spain to ensure the apartment is always clean. We also spend at least a full week in our apartment annually, where we review and update with latest modern cons. We know the minimum standard that we would accept when on holiday and try to ensure that this standard is met and should always be better. After a few bad experiences some of our early guests with transfer companies, I had to quickly find a fully insured transfer company and have now been using them for 14 years with no issues. Alan and his team are very professional and will pick you up at arrivals and take you directly to the apartment, they will also give you advice on the resort of Playa Flamenca. Thank you for taking the time for posting this review. We look forward to being part of your holiday plans in the future. Perfect for family of 4 ,the apartment was well equipped and spacious and very clean and tidy. Close to supermarkets and we would stay again no problems and we would have no problem recommending it to friends. The apartment is on the attractive complex of La Mirada with all amenities close by. It is ideally situated in the popular area of Playa Flamenca 8 km south of Torrevieja, and within 500 metres of several Blue Flag beaches. 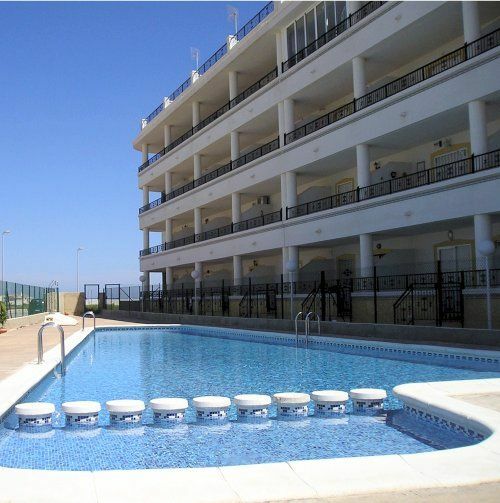 The property is located near Punta Prima and close to the popular Playa Flamenca Beach Centre. Playa Flamenca is unique, in that it can cater for many different types of holiday. You can enjoy a summer or winter break; a golfing or seaside break; a historic or maritime break, or perhaps a fun holiday with your children. You can play golf in a golfer's paradise, or relax on one of the many blue flag beaches. Drive west and enjoy the pine clad hillsides, the citrus orchards, the olive and almond groves, and the impressive palm trees that complete the lush landscape. Torreveja, a 10 min drive away, is a beautiful Spanish fishing town, boasting a marina, waterfront market, street entertainment, shops, numerous cafes, bistros, bars & restaurants. Golf: Playa Flamenca is surrounded by five first class 18 hole golf courses; Villamartin, Royal Campoamor, Las Ramblas, La Finca and Ciudad Quesada, all within a short drive from our apartment. Other courses including La Manga complex available within a 30 - 45 minute drive from the apartment. Villamartin golf course is located on the Orihuela Costa and is probably the best-known course in the area. Designed by Paul Putman and opened in 1972 the 1994 Mediterranean open was hosted here and won by Jose Maria Olazabal. The course is not too long, and is well adapted to the natural surroundings and terrain. Being located in the lowest part of a valley means it is not very undulating. There is plenty of Mediterranean vegetation as well as thick woods and there’s a natural precipice you need to avoid. A number of holes have water hazards. We can either arrange all your requirements for golfing at no additional cost or advise on how too contact the company we use. Additional local management cost of €60 per stay (payable locally). This fee is for cleaning the apartment before & after your stay and also being available 24/7 for any emergencies. Hopefully nothing will happen but it is good to have someone local at the end of a phone to assist you. EVENT RATES (90 Nights) do not include the cost of utilities, guests have to pay for utilities used.